North Korean leader Kim Jong-un met senior Chinese diplomat Song Tao and discussed “matters of mutual concern,” the North’s state media said Sunday, indicating closer ties between Pyongyang and Beijing ahead of Kim’s planned summits with South Korea and the United States. 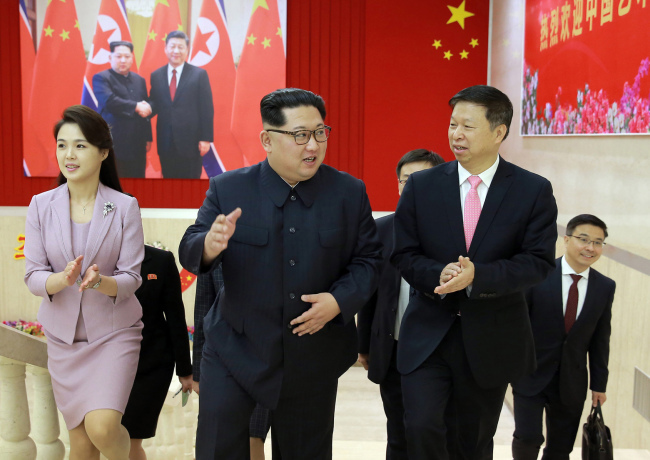 Kim met Song, head of the international liaison department of at the Central Committee of the Communist Party, on Saturday, according to the Korean Central News Agency. A Chinese art troupe, led by Song, arrived in Pyongyang on Friday to participate in the April Spring Friendship Art Festival held in honor of North Korea’s founder Kim Il-sung. “Exchanged in earnest at the meeting were profound views on the important matters of mutual concern ... and the international situation,” the KCNA said. The report did not elaborate on what those important issues were. Kim also extended his greetings to Chinese leader Xi Jinping after Song relayed Xi’s greetings to Kim, the KCNA said. The North’s leader expressed “satisfaction” over the recent development in bilateral ties between the two communist nations and said he would elevate their friendship into a “fresh phase of development as required by a new era by further strengthening of the bilateral relations,” it added. The North Korean leader made his diplomatic debut in Beijing last month, where he attended a summit with his Chinese counterpart Xi Jinping. Saturday’s meeting is perceived as a sign of an apparent thaw in China-North Korea ties as Song had previously failed to meet Kim during his Pyongyang trip in November 2017. The main aim of the trip was to explain the outcome of China’s 19th Party Congress. China-North Korea ties had been frayed in recent years on the back of Pyongyang’s relentless pursuit of nuclear weapons and Beijing’s support of crippling United Nations sanctions against the rogue nation. Experts claim that Saturday’s talks mainly revolved around key diplomatic issues including the North’s denuclearization and Xi’s plans visit to Pyongyang, which was discussed during Kim’s Beijing trip. “Based on both old and newfound cooperation between the two neighboring nations, it seems denuclearization and securing peace and stability on the Korean Peninsula were the main focuses of the talks,” Yang Moo-jin, a professor at the University of North Korean Studies said. The visit was also a plan to showcase improved China-North Korea ties, according to other experts. “It is a way of showcasing that North Korea-China ties had gotten stronger and that China has had and will always have a key role in the such North Korean issues” Kim Yong-hyun, a professor at Dongguk University, said. Separate talks between Ri Su-yong, vice-chairman of the Central Committee of the Worker’s Party of Korea and Song Tao were also held on Saturday, according to KCNA, where they discussed further development of ties based on the agreement made at the historic meeting of the top leaders of the two countries. The inter-Korean summit is scheduled for April 27, while US President Donald Trump said he plans to meet Kim in late May or early June. But a significant gap remains between the US and North Koreas’ positions on the path toward denuclearization. Pyongyang has suggested a need for phased and synchronous measures for denuclearization, while Washington is calling for the North to dismantle its nuclear program in a complete, irreversible and verifiable manner. Kim Il-sung’s birthday or the Day of the Sun, which falls on April 15, is considered as North Korea’s biggest national holiday. The North has held a biennial event since 1982 to mark the birthday of the late founder and Kim Jong-un’s grandfather.